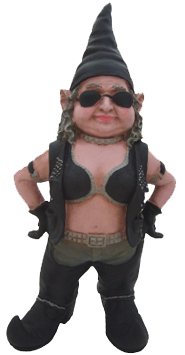 For the biker or the rebel who has everything, we present our Biker Babe Garden Gnome! This is a woman who does not take "no" for an answer. She's uncompromising and tough, and among the most impressive of our garden gnomes. Resplendent in her leather biker gear, she's got plenty of attitude and isn't afraid to let you know exactly how she feels. If you know someone like that – or you are someone like that – this biker gnome was made especially for you. She's 20 inches tall, made from cast stone resin and looks very impressive standing tough in your yard or on a front porch. Make sure you address this girl garden gnome with the respect she deserves. We also offer the male biker gnome in a 20-inch size. Give the girl some company.